Sacrobosco (d. 1256?) is famous for his textbook De Sphaera (c. 1230) which explained the spherical geometry used by Ptolemy and his Islamic commentators and remained popular for four hundred years. It is thought he was born in England and taught at the University of Paris. 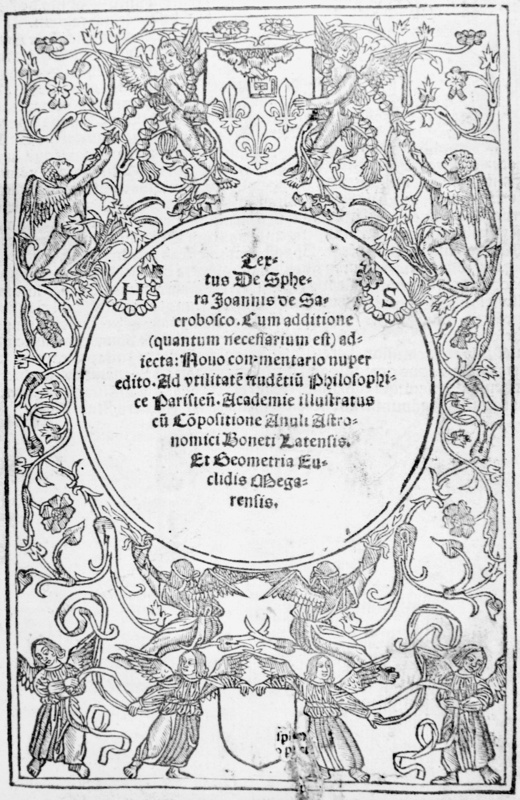 Title-page of an edition of Sacrobosco's De Sphaera with commentary by Jacques Lefèvre d'Etaples and other works, from the shop of Henricus Stephanus, 1516. Reliable information about the life of Johannes de Sacrobosco is scarce, and standard sources such as the Dictionary of Scientific Biography have unfortunately included as fact material deriving from the speculations and inventions of sixteenth- and seventeenth-century antiquarians. On the basis of a statement made in 1271 by his commentator Robertus Anglicus, he is believed to have been of English origin; his name is frequently anglicised as John of Holywood. At some time in the earlier part of the thirteenth century (according to a seventeenth-century account, it was June 5th 1221) he arrived in Paris and formed an association with the university there, although whether it was initially as an arts student or as a licentiate (one who, by virtue of having been made a master of arts at another university was already qualified to teach) is not clear. It is presumed that at some point he was enrolled as a regent master lecturing on mathematics and astronomy. After his death, which may have occurred in 1256, a memorial was constructed in the monastery of St. Mathurin, closely associated with the University of Paris. This was decorated with an astronomical instrument, perhaps an astrolabe, and a few lines of Latin verse which referred to Sacrobosco's calendrical work; it is no longer extant. 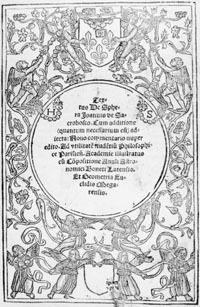 Sacrobosco's importance in the history of astronomy stems from his authorship of some of the most popular and enduring textbooks of the middle ages. His Algorismus, perhaps his first work, was a treatise on numerals and arithmetic. The most famous of his works, De Sphaera, a basic account of the spherical geometry underpinning the mathematical astronomy of Ptolemy and his Arabic commentators, was composed c. 1230. It rapidly achieved popularity, and was reproduced and commented upon even into the seventeenth century. The Compotus or De anni ratione, a treatise on the calendar and calendrical computation, can be dated to c. 1235, while the Tractatus de quadrante, which describes the construction and use of the so-called quadrans vetus or old quadrant, was composed after 1239. Other works, including commentaries upon Aristotle, have been ascribed to Sacrobosco, but these attributions are considered dubious.